Most of us have experienced a ‘muscle twitch’ at some point in our lives, when a muscle starts contracting involuntarily. However, this is not the same as ‘twitch muscles.’ The word ‘twitch’ in reference to twitch muscles isn’t exactly a movement or action, but how rapidly our muscles are firing. If you think back to middle school science class, you might remember labeling diagrams of the human body with various muscles. While a muscle might just look like a single hunk of meat, it is actually made up of thousands of muscle fibers – strands of protein that work together to help the muscle contract and relax by shortening or lengthening. Each muscle fiber strand contracts in a certain way that determines whether it is a slow twitch muscle fiber or fast twitch. Most muscles that we use for everyday tasks contain both slow and fast twitch muscle fibers in almost equal proportions. However, some muscles contain more of one type of fiber, which changes how that muscle group responds to physical activity and exercise. Slow twitch muscles effectively use oxygen to produce energy, allowing them to be used for long periods of time without experiencing fatigue. Slow twitch fibers are activated when doing activities like walking, long-distance running, and cycling. Fast twitch fibers generate short, powerful bursts of energy. These are the fibers activated when doing activities such as sprinting, jumping, or heavy weight lifting. These fibers also tire more quickly than slow twitch muscles because they use oxygen less efficiently than their slow counterparts. During physical activity like running, slow twitch muscles are used initially. When these muscles become fatigued, fast twitch muscles are activated. To increase strength and gain mass, fast twitch muscle fibers need to be activated. While activating slow twitch muscles can help to improve stamina, a holistic workout should activate all muscle fibers. How Does Twitch Fitness Use Slow And Fast Twitch Muscles? 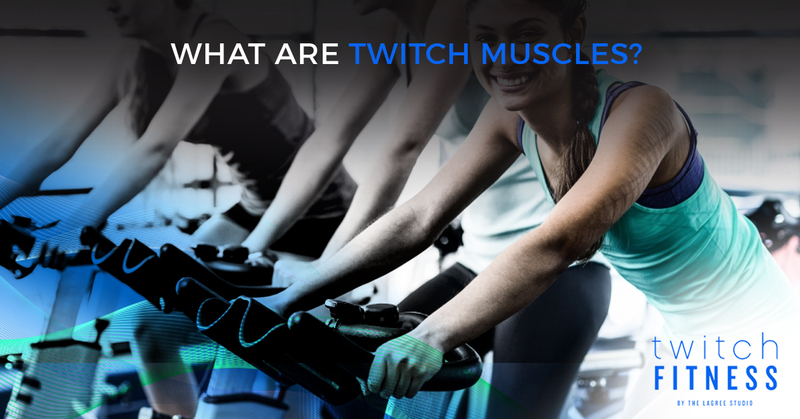 Our Twitch fitness classes target different muscle fibers based on what your goals are. Our megaformer workout class solely focuses on slow twitch muscles to burn fat, build lean muscle, and increase endurance. Our fifty-minute megaformer and versaclimber workout class targets slow and fast twitch muscles to build muscle and get a total-body workout. These low-impact exercise classes are intense and movements are performed by controlled body movements that do not rely on momentum like many other fast twitch muscle exercises do. Is Twitch Muscle Training A Fad? We don’t think so. The focus on twitch muscle training has come from a greater understanding of our bodies and how our muscles work, grow, and expend energy. This isn’t a fad, but an advancement in the way we can take control over our fitness. Are You Ready To Twitch? Twitch Fitness, by the Lagree Studio, offers multiple group exercise classes that range from beginner-level to advanced, as well as private fitness classes with a personal trainer to help you get the most out of your workout. Book your spot for one of our group fitness classes today at the Lagree Studio!